I think the soft tones and delicate detail make the image. yup i predicted it, well done! Congrats on your first Travis. Simple & effective. Toning was perfect for the mood set, and the focus on the adult hand forms a great leading line, pulling my eyes right in to the focal point. Congrates on the win. Very simple but attractive shot. The image says everything. Excellent work. Message edited by author 2005-10-05 06:14:20. Congrats on the very warm image. Friendship has no age boundaries--well deserved! Message edited by author 2005-10-04 18:22:33.
hi, beautiful picture, congrats ! This is very sweet. Congrats! Hey Travis:way to go. You see, you were past due the credit you deserve. Congratulations on this heavy Blue. Thanks for all the comments everyone. This was my dad and daughter, I did not expect to win a ribbon with this let alone get first place. I just want to thank you all for the comments and the votes. Wow! Congratulations on your BLUE and a very sweet image! Would certainly make a wonderful card! im very happy you finished first..my comment about the little baby having working man's hand's was just sarcasm, I gave you a 10 for this, and I don't think I scored anyother photos a ten for this challenge. I really think a simple photo like this speaks out in volume. Congratulations. Wonderful, and it looks great in black and white. Congrats on the blue Travis well deserved this is a beautiful shot. Congrats Travis on the 1st place finish. A nice simple composition that tells a nice story. Good work! Congrats on your first blue. Outstanding shot. Fantastic shot, congrats on the blue ribbon. Fabulous!! Congratulations on such a wonderful picture and your first blue!! great shot! a ten and favourite from me! Superb shot Travis!! Congrats on you very well deserved blue ribbon. congrats! this is great!! Happy Anniversary! Congrats Babe!! I knew you could do it!! I love this shot and not just because it's yours! What a happy ending to our perfect anniversary!!! Congratulations, Travis. Its a beautiful image! Oh yeah baby! Congrats Travis on another great shot! Oh yeah! One of my fav's. Great work & congrats! Lovely. I like the tone of this picture and the contrast between the textures of the hands. Great picture. Themes doesn't get any better than this. Nice job! cliched but very well done! Very succint. Excellent portrayal of the theme. Fantastic shot! 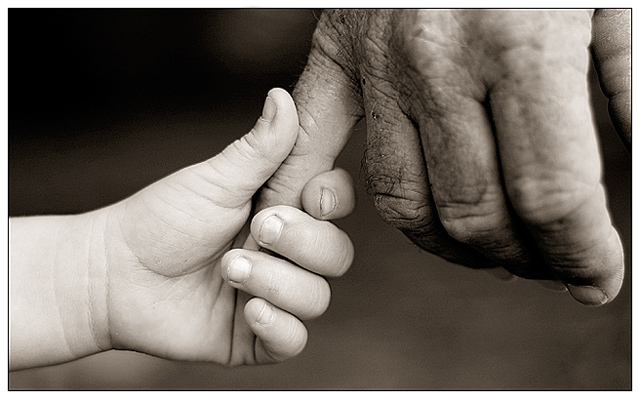 The contrast between the old and young hands makes for a great image. Perfect DOF. My eyes are drawn right to point of attention. Good depth of field use. Absolutely beautiful photograph that works perfectly for this challenge. Very nicely done! Perfect for the challenge; well conceived & done. Congrats! I like this image. Very bold, yet emotive composition. I have viewed this numerous times. Sometimes I smile and sometimes I tear up. It takes my breath away. I certainly think you will win a ribbon. It captures so very many emotions, and I am certain different ones for each person. Bravo! wow...good picture...10..!! Best one yet..!! Darling. Gets the idea across, and it's a fine shot. Awesome shot. This would fit so many categories. Wonderful concept, great execution. A very touching shot, so full of emotion. Good work on this. A sweet shot that seems to me to be very fitting for the front of a greeting card. Nicely blured background. Works well in B&W. Excellent capture. Looks unstaged. Top 3 I hope! 10. Awesome photo, I love the power this image conveys. Great composition. The contrasts work on many levels. The age, the dark and light, the smooth and wrinkled. Nicely done. Proudly hosted by Sargasso Networks. Current Server Time: 04/25/2019 08:25:34 AM EDT.